There is a very informative video tutorial available on the Marly Bird YouTube Channel. In the video I show you how to read the instructions as written in the PDF, but I also show you how to read the row by row chart/spreadsheet I wrote to make the crocheting even easier for this blanket. It gets even easier than that! Once you have the stitch pattern down and only want to use the color sequence, then you could just follow the color sequence chart that is below! 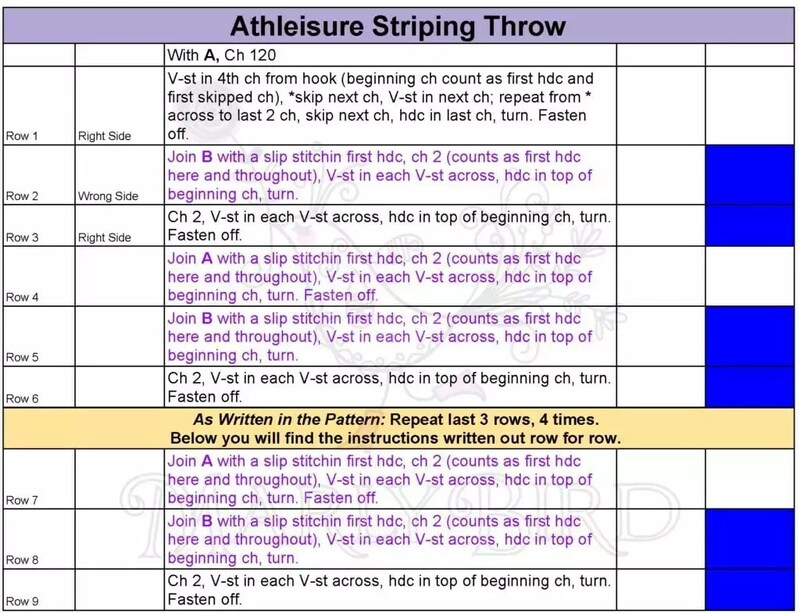 The instructions for the Athleisure Striping Throw Crochet Pattern are written in 3 different ways all to make crocheting this throw as easy, as simple, and as painless as possible. You’re certain to have success on this afghan. Only thing I would like to add is that many newe crocheters have a hard time with the reverse single crochet, so I recommend having them do the twisted single crochet on the edges. Love this blanket. Not sure about row 96, shouldn’t it be chain 2, turn? Not fasten off. I have also found the use of stitch markers very helpful. Thanks for all your great toutorials! Marly, have you corrected the color sequence chart/spreadsheet? If not, I will try to recreate the chart for my use. Thanks you ever so much,you have help me 100 percent. Marly you are just so happy and buting a smile on this old soul.Stay as you are just beauitful lady. Hi Marley , you begin the stitches with the white but in the picture it shows blue. I’m I correct ??? Hi Marly.. I would like to try this blanket but can it be adapted? Is there a multiple number of chains or something to make it wider or smaller? Really wish you would give us an idea how many skeins needed. That informationi would be very helpful for newbies, especially if we’re using yarns with lot numbers. Thanks Marly. I am constantly amazed at people who ask questions, that are in the instructions, or video. Now here I am, guilty of the same. I printed the instructions as well as the color graph, yet missed the answer to my one question. Sorry! Miss Marly, I absolutely love this blanket! I have been searching high and low for a cute blanket for my cousins new baby boy who will be arriving after the New Year. So, now that I’ve found what has settled my creative heart I’m hoping you could tell me the stitch multiple so I can down size it for baby?? I thought about trying to literally cut the pattern in half, ch 60, but I realized I’d end up with a super skinny long blanket lol. Help pls. Hi Marly, Love the video on the blanket but after downloading the pattern I went looking for the download on the worksheet and can’t seem to find it. Can you help with a link to download the worksheets you made?